Vinyl car wrap Denver professionals specialize in wrapping vehicles and fleets for local Colorado businesses. One of our favorite business vehicles to wrap is the visually appealing food truck. When it comes to business, many food truck owners have an idea of how they want their design to come out, but their primary focus is the items on their menu. 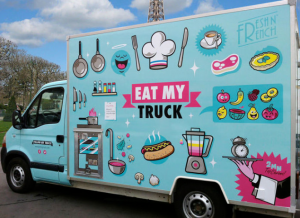 We understand this completely, and that is why vinyl car wrap Denver professionals are here with some handy tips to consider if your food truck business is considering a flashy wrap for the holiday season. Before you even begin considering the type of design you want for your food truck, you must look inward. As yourself what makes your business unique, and why people love to order up at your window. Once you can figure out what puts you a step above the competition, you can then begin to highlight these qualities within your design. Your story and core beliefs should be what anchors your food truck wrap design. Take some time to meet with your designer one-on-one. During this meeting, tell them your story, who you are, and why you even got into the food truck business. Remember, your designer is not the specialist of your industry, you are. Getting the right vibes in place before the initial wrap design is very important. Scheduling this meeting will definitely seal the deal on this part of the design process. Once your designer has their creative juices flowing, the real fun begins for your wrap. They know that your brand is your pride and joy, and they want to keep it that way. They only ask that you approach this project as more of a partnership than an assignment. They want to make your food truck the most appealing one in its niche. They will make every effort to make your food truck pop. Consider your most visually appealing item on the menu and slap it on the side of your truck! At the end of the day, your food truck wrap is a mobile advertisement that draws your customers in. You ‘d be surprised at how effective a vibrant image of your best item is compared to an illustrated lookalike. Your story and core beliefs should be what anchors your food truck wrap design. During this meeting, tell them your story, who you are, and why you even got into the food truck business. Getting the right vibes in place before the initial wrap design is very important. We want to make your food truck the most appealing one in its niche. At the end of the day, your food truck wrap is a mobile advertisement that draws your customers in.